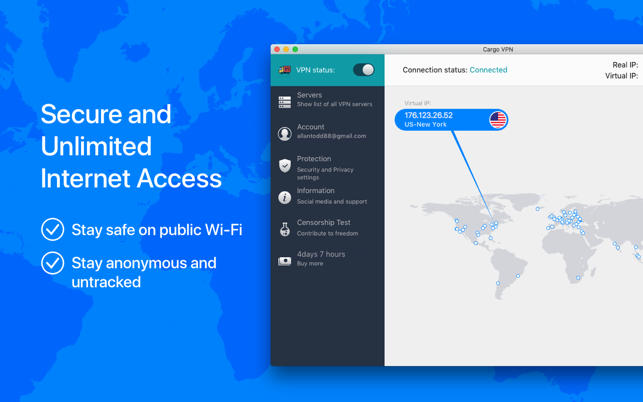 Cargo VPN is an essential privacy tool for the websites you visit, your IP address, geolocation, personal communications. 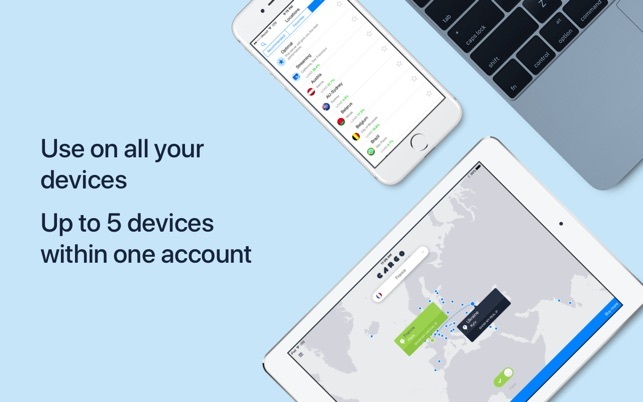 With Cargo VPN for Mac and its built-in DNS Firewall you don't have to worry about malware, logs, and other potential threats. *Hide IP address, location and online identity for maximum privacy protection. *Keep your data safe while connecting to public WiFi networks in airports and hotels. *Keep your online activity, location, communications, and traffic away from the unwanted surveillance and monitoring. *Keep your sensitive data safe: login details, account numbers, billing address, etc. *Save on flights, hotels, rental cars and more by simply playing with your geographical location through VPN. 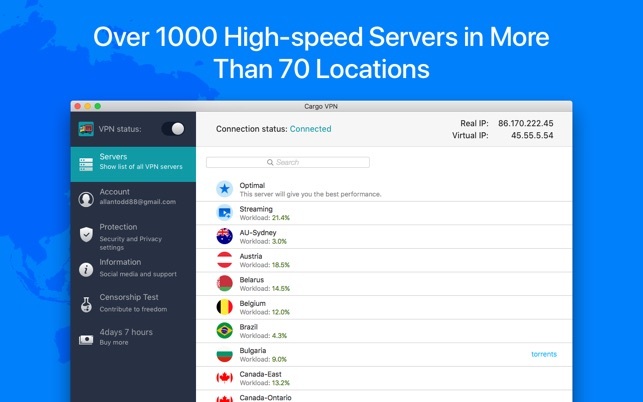 *Over 70 VPN server locations with more than 1000 high-speed servers across the world ensure top protection level of your privacy. *Stay protected from malware websites. * Personal Static IP that is exclusively yours. * Personal Server can take the speed and protection to a higher level. 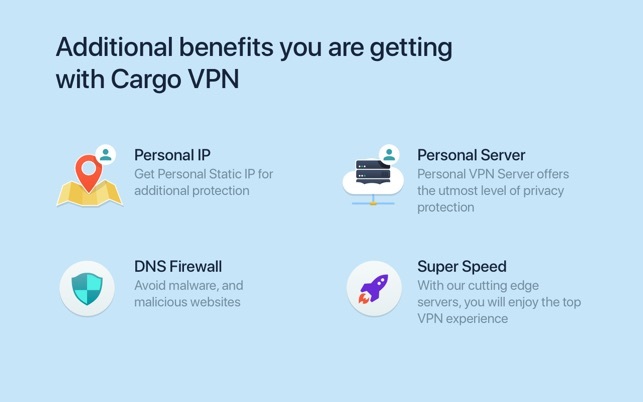 Cargo VPN has a 24-hour free trial period. ** Subscriptions are auto-renewable unless canceled. - Subscriptions and automatic renewal can be managed by users in their Account Settings after purchase. - The cancellation of the current subscription is not possible during active subscription period. - Subscription will be automatically renewed unless auto-renewal is turned off at least 24 hours prior to the end of current period. 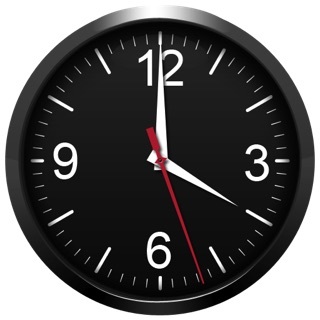 - At the time of renewal your account will be charged for the amount of your current subscription within a 24-hour time frame before the beginning of the new period. All costs are as described above. Fixed: issues with logging in via Google Plus. Fixed: crashing upon closing certain windows. Just tried Cargo and having no luck signing in. It actually locked me out of their system when the password I used was input more than 5 times. Their system also said it’s sent me emails but that’s not true. I’m sticking with ExpressVPN which has worked extremely well for me, and its website is hyperresponsive. If CargoVPN goes out of business because of its creators’ ineptitude, all of us in the Mac community are better off. These folks don’t know what they’re doing, and their customer service is nonexistent. Avoid like the plague! I'm sorry for this inconvenience. 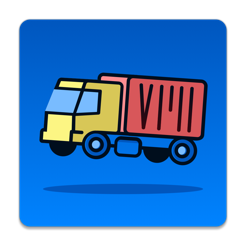 Please contact our Cargo VPN support team via email cargovpn_support@eltima.com. We will be happy to help to sign in and reset the password if needed. Hope for your understanding. A fraud product, DO NOT PURCHASE! This service doesn't have free trial, it asked for user's bank card information right after user registers a new account. Their service can't be used at all, it doesn't function at all. I sent them an email but never got replied. It seems this is a fraud product, don’t suggest to purchase, otherwise you’ll be in the same situation as me now, don’t know who to contact, even though they provide you support email, they will never get back to you. That is not the experience we want you to be having. 1) We offer a free 1-day trial period for the Service, so you can make sure that everything is working fine for you before you make a purchase. 2) We have a 24/7 customer support service that is always ready to answer your questions and provide appropriate assistance. They can be reached via cargovpn_support@eltima.com . You’ve mentioned that you’ve sent us an email, are you sure that you’ve used the correct address? Also, there is a possibility that your email got to spam. 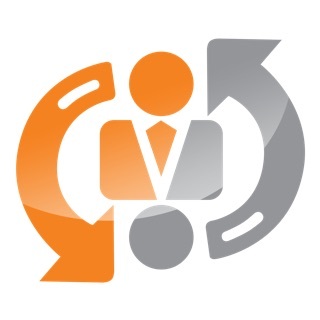 Please, try to contact our support service one more time by sending an email to cargovpn_support@eltima.com or within the application (Information tab -> Contact Support) providing more details about the issue you are facing, and we’ll begin. App covers all my needs. Reasonable pricing, fast speed, stable connection, lots of servers. As long as it provides this level of security and support I will not change it for another.